Well, another good day in the park. I began around 5:30am from my cabin at Canyon and headed toward the Hayden Valley. My first bear sighting was about 5 minutes later when I was passing the turn off for the Brink of the Upper Falls. It was a medium sized black bear that had a black and red coloration. He quickly moved into the trees and out of sight. I attempted to get some shots, but as yesterday, it was very cloudy and not much light. I then proceeded toward the valley, where I was rewarded with seeing the beaver at Otter Creek out browsing on the side of the road again. I decided not to stop, because I had spent so much time with him the day before. And I glad I went on. I stopped at some of the first pull outs on the north end of Hayden for a look, but I didn’t see anything of interest to me. I headed on to Grizzly Overlook and the people were excited. The Canyon Pack was on the move, all four of them. I saw them and started to calmly get out the 600mm and its tripod and I had kept an eye on the wolves and they were moving fairly quickly to the south. So I loaded up the truck and headed to Beverly, Beverly Hills that is, wait, I really meant to the first set of turn outs to the south of Grizzly Overlook down along the river. This was a great move. 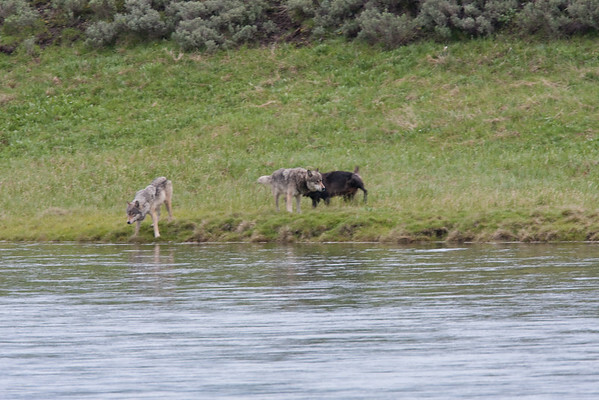 The wolves continued south along the waters edge when about 100 meters to my north, the whiter of the grays swam the Yellowstone coming to my side. It proceeded to the other side of the road and up the hill. Meanwhile, the other three (including the black male alpha and the gray female alpha (my assumption since they were collared)) proceeded south on the river bank. Then the other three began to cross, but I had lost sight of the white. She had actually recrossed the road to regroup with the others. When the other three got across the river, they all headed back across the road and up the hill to the west. What an exciting experience. I continued south and stopped at the last big overlook on the south end of the valley. There were some Sandhills Cranes whooping it up and it gave me the opportunity to practice (because I really need it) with stacking the 1.4x and the 2.0x on the 600mm. This combination requires manual focusing, and I think I have got it, but when I look at the pictures, good luck. From here I continued on my standard patrol and headed to fishing bridge, then out to Mary Bay and Lake Butte Overlook. No sightings but it did give me the opportunity to call the wife, because that is about the only place my T-Mobile phone gets reception on the east side of the park. I then headed back toward the Hayden and was rewarded with observing the grizzly from the night before looking around the sage near the elk herds. He provided a decent show. Now it was over the hill and on to the Lamar. I didn’t catch any action on Washburn, but at Yellowstone Picnic Area there was a lone Bighorn Ram browsing. While watching, a Pronghorn came down and crossed the road with her twins. Then it was on out into the Lamar. I stopped past the Yellowstone Institute to observe the Lamar Bison Herd and some Pronghorn as well as catch a bite. Just as I was finishing up it started to rain. So I headed on east. When I got out to the parking area near the Druids, I stopped to see what was going on. Last night the spotters had seen 4 pups in the vicinity of the den from last year. I chatted with some nice folks about it and they gave me the locations of some coyote dens that are within observation distance. I will confirm that tomorrow, I hope. I forgot to mention that I stopped at the Tower Ranger Station and received confirmation that the cow and calf moose at Trout Lake had passed. I began heading out to the northeast to look for goats and moose, and unfortunately, began to not feel well. So I stopped for a few minutes at Pebble Creek and decided that I needed to head back to Canyon to lie down. 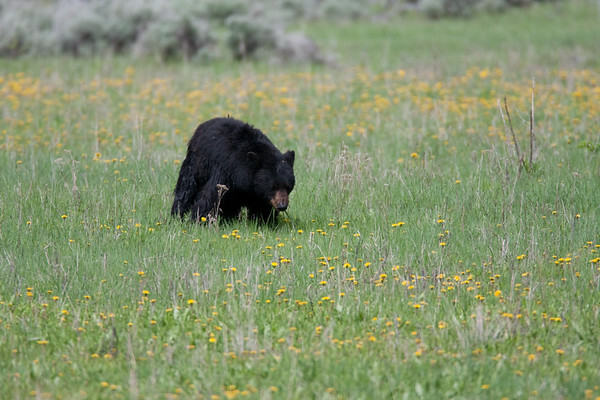 When I left Pebble Creek a small black bear had begun browsing on the yellow flowers in the Meadow. So I decided to wait and watch and shoot for a while. But with nature calling me, I had to head on back to the cabin. Just past the footbridge, I was fortunate enough to find a bison jam that took about 30 mins to clear. Then I headed on back to Canyon without adventure. I headed back out from the cabin at 8:00pm to go back to Hayden for the sunset show. There was a grizzly across from Grizzly Overlook heading back into the trees. Then I went to Elk Antler Creek where there was some commotion. I reported that the night before I had seen a beaver there. I now think it was actually muskrats. I can confirm that there were at least 3 if not 4 muskrats there tonight. It was time to call it an evening when the Grizzly Overlook bear arrived across the river continuing south. But this was just a speck. Then some folks I had met today, told me of another grizzly running through the meadow at the north end of Hayden, but unfortunately I was not to see it. It was time to get ready for the next adventure. I hope to see you under the Western Skies.